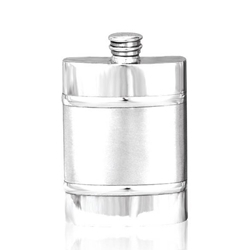 Our Plain Satin Band Pewter Flask 4 Ounces measures 4.33 inches tall by 2.75 inches wide. With a long history and tradition within the pewter gift ware industry, we pride ourselves on crafting the most attractive and highest quality pewter hip flasks, and this is beautifully demonstrated by this flask. The elegant hip flask has the traditional rectangular shape, and features a satin band running around the center which is flanked at the top and the bottom by two raised bands with a mirror like finish, and the highest quality of pewter is used to ensure that its attractiveness does not fade over time.